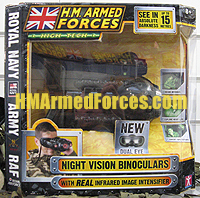 Following the success of the Night Vision Goggles, Character Options in conjunction with HM Armed Forces, are releasing the new HMAF Night Vision Binoculars. 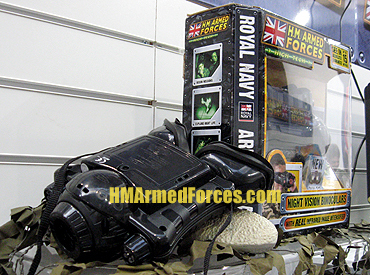 HM Armed Forces Night Vision Binoculars feature a real infrared image intensifier which allows the viewer to see up to an amazing 15 metres in absolute darkness. The new ‘dual eye’ technology makes these Night Vision Binoculars even more suitable for covert HMAF missions under cover of darkness. The binoculars feature soft rubber mouldings, dual mode surveillance, and adjustable straps. They can even be used over glasses.